Thanks to all who submitted a caption entry in our contest! Our talented panel of judges (a.k.a. CFCA employees) has selected a first-place winner. To keep things impartial, the judges heard the caption only when they were judging and not the author’s name. Kristi will receive a “Zamboanga” music CD and recognition from the general CFCA community. Congratulations! 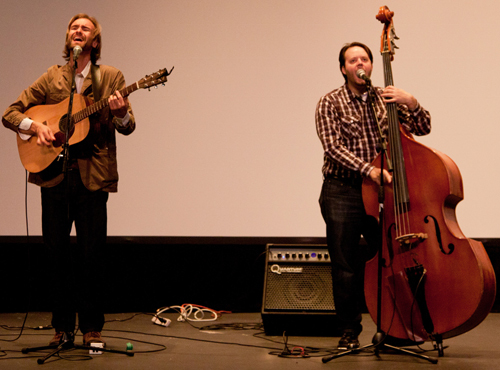 As a side note, this photo was taken when Barclay Martin and Rick Willoughby were performing at the “Rise and Dream” world premiere at the Thin Line Film Festival in Denton, Texas. “Rise and Dream” is the CFCA documentary film about 13 teenagers in the southern Philippines whose spirits outshine the challenges of their daily reality.